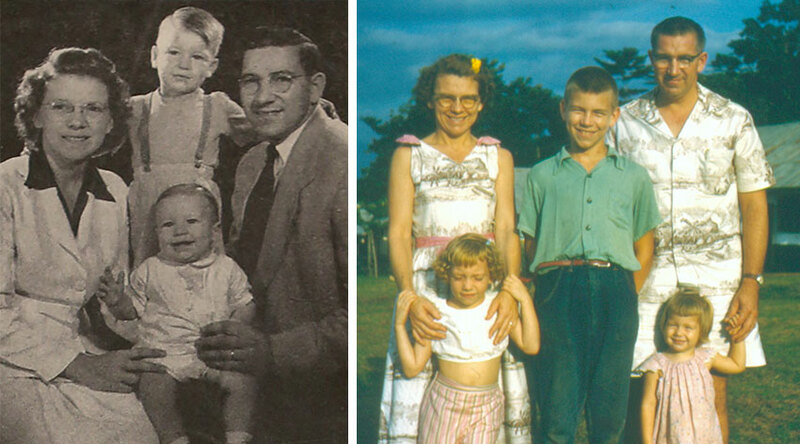 Left: The Baker family in 1949, when they arrived in Sierra Leone: DeWitt, Evelyn, Ron, and Norman. Right: A later picture of the Baker family after the death of Norman, with daughters Joyce and Annette. For the DeWitt Baker family in Sierra Leone, 1955 began in celebration with the dedication of Centennial High School. But the year ended in tragedy. Evelyn Baker homeschooled her two sons—Ron, in fourth grade, and Norman, in third grade. The boys often joined their school friends for recess. On December 1, 1955, Ron and Norman joined Mattru students in their annual end-of-the-year picnic, being held two miles down the Jong River at the island village of Pipah. Colleen Sundstrom, another missionary kid, age ten, tagged along. Solomon George, a teacher, was in charge of the day’s activities. DeWitt went to the wharf at 7:00 a.m. to help Ron, Norman, and Colleen into the crowded boat for the all-day excursion. At the end of the day, everyone climbed aboard the boat for the trip back to Mattru. Many children were atop the cabin roof, doing an African dance and beating a drum. Before the launch cast off, Solomon George asked the missionary kids to come down from the roof. He spoke specifically to Norman, the youngest, warning him that it was safer inside the boat. Norman complied. As the boat swung into the swift current, the supporting struts buckled and the roof collapsed, throwing Ron, Colleen, Solomon George, and many students into the river. Mr. George, who couldn’t swim, grabbed a floating board, but when he realized that Colleen couldn’t swim, he gave her the board and told her to hang on. A canoe eventually picked her up, but Mr. George drowned. Ron, a good swimmer, helped another struggling teacher make it to the shore. Twin brothers John and Jonny Williams also fell off the launch. One reached shore, then swam back to help his struggling brother. Both boys drowned. So did another student, James Sankoh. In all, the accident claimed the lives of Solomon George, three male students…and Norman Baker. When the capsized boat was pulled back to shore, Norman’s body was found under the crumpled roof. He had been sitting under the roof, but leaning out over a partition to watch the diesel engine. When the roof collapsed, rafters fell across his neck and killed him. “Norman was laid on a cot in our living room near a front window. Some came inside to look at him and went back out, calmly and respectfully. They had never known a fatal accident to occur to a missionary child….Our calm acceptance of Norman’s death was a witness to the crowd of mourners of our faith in God. 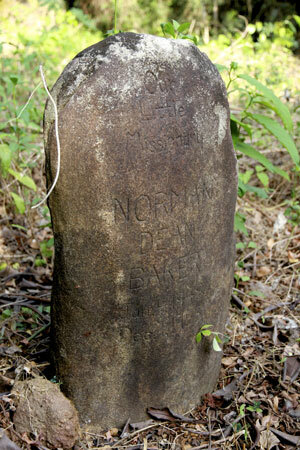 That morning P. C. Dole, a Sierra Leonean pastor, led a memorial service for Norman at the Mattru church. Burial would be in Gbangbaia, 25 miles away, where the Bakers had lived for two years. A long procession followed the pallbearers as they carried the casket to the ferry. Two miner’s jeeps then carried the casket, missionary friends, pall bearers, and others on the bush trail to Gbangbaia. Friends lined the path leading to the church, where Pastor Henry J. Becker led a second memorial service. Then the casket was carried downhill to the Danville cemetery, where other missionaries and nationals were buried.